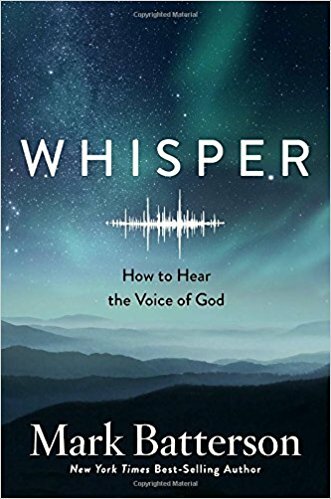 Mark Batterson’s newest book—Whisper—is all about learning to hear what God is speaking to you. Check out my review of Whisper by clicking here. More quotes from Whisper coming soon! Does God still speak to people today? If He does, how can you learn how to hear His voice? Mark Batterson has some answers to those questions in his newest book Whisper—How to hear the voice of God. Whisper is divided into two broad sections. In the first section, you will learn the power that is available to anyone who will learn how to listen to God’s voice. In the second section, Mark shares the seven languages God uses as He communicates with us. Some of these “love languages” will resonate more with you than others, depending on how God has hardwired you, but all seven languages together give all of us a comprehensive picture of how to become more tuned-in to what God is saying to us. If you are longing to hear God speak to you more clearly, Whisper is for you! I am a Multnomah book reviewer. “The fact is when we merely ‘adopt’ what’s happening, we tend to drift. Cultures do this; schools do this, and families to do this well. Years ago, Lawrence Miller wrote about this topic in Barbarians to Bureaucrats. He observes that companies, organizations and schools ‘evolve’ over time, but actually the evolution usually becomes a ‘drift’ away from the very premise it was built upon. “The process starts with the ‘prophets.’ They’re the people with a vision for something new. They’re idea people. But they’re usually threatening to the existing order and are often ignored, criticized, frustrated or otherwise rejected. “Eventually, however, people recognize the need for change. That’s when the ‘barbarians’ step in. They’re the ones with the influence to knock heads together, and again the power to implement the changes the prophets suggested earlier. They are often people like Steve Jobs, Ted Turner, or Oprah Winfrey. They conquer territory that some assumed could never be conquered and foster change. “Following the ‘barbarians’ come the ‘builders’ and the ‘explorers.’ These people take the empire the ‘barbarians’ conquered and begin to build bridges, chart courses and develop systems that enabled the empire to grow and prosper. “Next, come the ‘administrators.’ This type of person almost always follows, because the ‘builders’ and ‘explorers’ get bored and need someone who enjoys managing a system. They add no new ideas or wealth, but simply keep things running smoothly. “Eventually, the ‘administrators’ give way to the ‘bureaucrats.’ These folks not only add no new ideas, but they actually suppress innovation and focus their efforts on maintaining control of the empire. Change is too messy or expensive. To keep money flowing, ‘bureaucrats’ tend to concentrate on cost-cutting and re-organizing, milking what’s left of the old ideas. It’s important to note—one of the chief goals of the bureaucrat is to suppress the rise of any new order of prophets. “The final phase of this downward spiral is the shift from ‘bureaucrats’ to ‘aristocrats.’ They’re the ones who’ve inherited the wealth of the previous generation and occupy themselves with consuming the last benefits from the old ideas. Fortunately, they don’t last very long in a competitive climate because they get bumped off by new ‘barbarians’ who promote the ideas of outside prophets from other places. In short, change will either happened to us, or because of us. 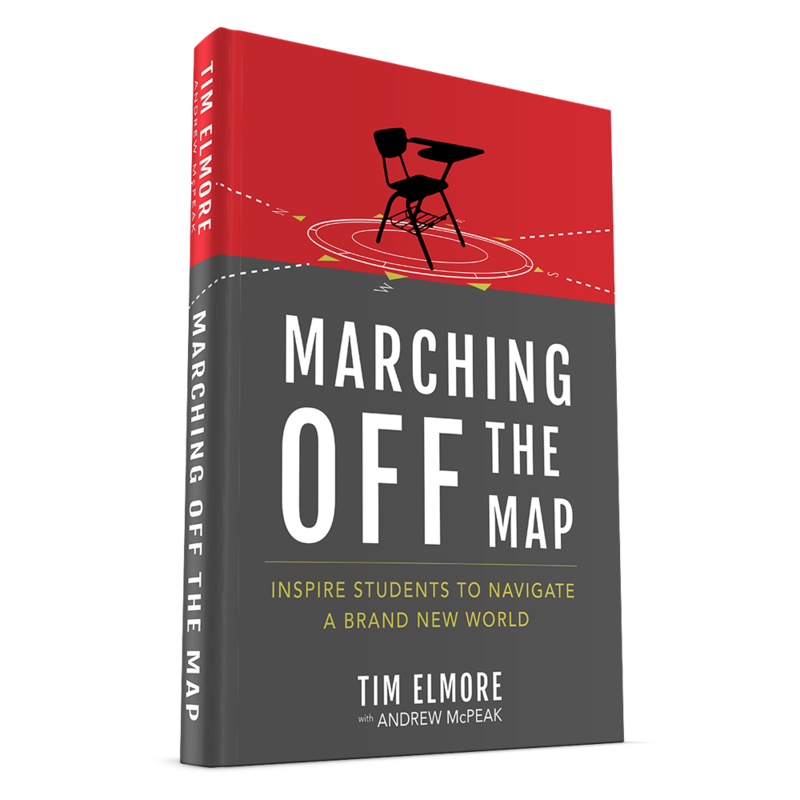 If you haven’t already, check out my review of Tim Elmore’s book here. 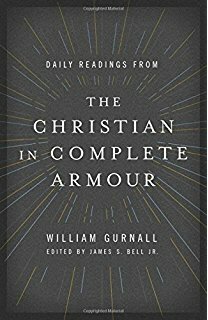 I have shared several other quotes from this amazing book, which are all compiled here. There’s a time when David was fainting and had no one to help him—my spirit was overwhelmed and fainted, throwing all its weight on me. I look for someone to come and help me, but no one gives me a passing thought! No one will help me; no one cares a bit what happens to me (Psalm 142:3-4). Here’s the backdrop to this prayer. King Saul has tried to kill David twice, not including the time Saul sent assassins to David’s house to kill him there. Even Jonathan, Saul’s son, was embarrassed and grieved at his father’s shameful treatment of David. David runs away from Saul so quickly that he doesn’t take any food or even a weapon. He literally only has the clothes on his back and the sandals on his feet. He’s able to get some day-old bread from Ahimelech the priest, and he also takes Goliath’s sword from the temple. David is clearly not thinking clearly. He is wearing Goliath’s sword on his side. Remember that David killed Goliath. Goliath is from Gath. And where does David run? To Gath!! He has to pretend he’s gone insane in order to escape from Gath, and he flees to the cave of Adullam. After he did all that, he still says, “God, listen to my even louder cry! Just how desperate is your situation? Just how heavy is your burden? Have you come to the realization that God is your ONLY help? Then, like David, cry out louder and louder to Him until He answers you! A blind man got the attention of Jesus by yelling at the top of his lungs, “Jesus, Son of David, have mercy on me! !” Jesus said that this man’s faith healed him. What was the demonstration of his faith? It was the persistent calling out to the only One who could help him. 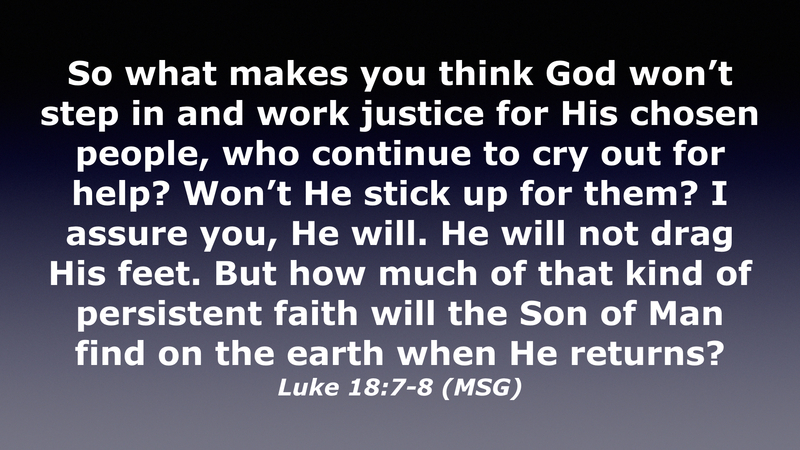 Earlier in this chapter, Jesus says this: So what makes you think God won’t step in and work justice for His chosen people, who continue to cry out for help? Won’t He stick up for them? I assure you, He will. He will not drag His feet. But how much of that kind of persistent faith will the Son of Man find on the earth when He returns? (Luke 18:7-8). Once again Jesus links a continual cry for help to the definition of persistent faith. So I’ll ask again: just how desperate are you for God to answer you? If you will cry out loud to Him, God will see your persistent faith and will step in and work for you. Please join me on Sunday as we continue to learn more lessons from David’s prayers. 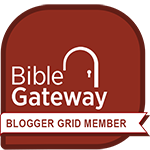 Saturday In The Psalms—No One! The Lord reigns… (Psalm 93:1). When biblical authors use repetition or parallelism, it’s important to take note. They are wanting to make sure their message is heard loud and clear. They want what they’re sharing to stand out from everything around it. This is sort of how we would use bold or italics, a different colored font, or even a LARGER FONT to make something stand out. 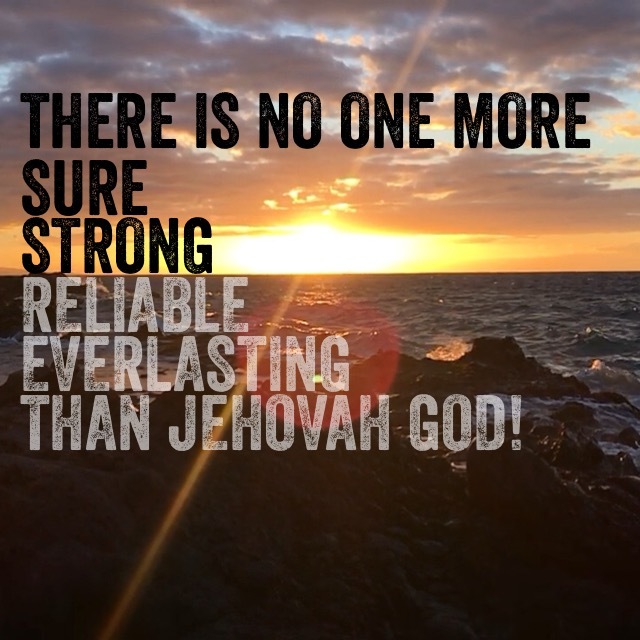 There is no one more sure, strong, reliable, and everlasting than Jehovah God! 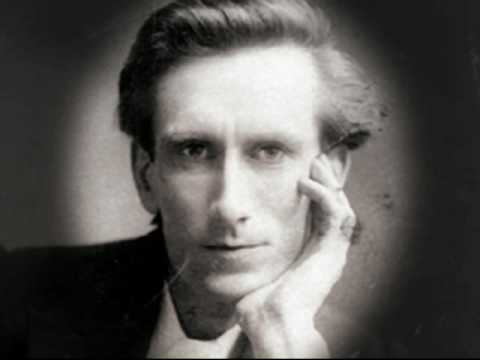 “When such embers of contention begin to smoke among Christians, we can be sure satan planted the spark; he is the one great kindle-coal of all strife. Look what happened to Zacchaeus—“Zacchaeus stood up and said to the Lord, ‘Look, Lord! Here and now I give half of my possession to the poor; and if I have cheated anybody out of anything, I will pay back four times the amount.’” Who had been talking to him about his doings? Not a soul. Jesus had never said a word about his evil doings. What awakened him? What suddenly made him know where he was? The presence of Jesus! Oh, do let us get back to this tremendous confidence in the Lord Jesus Christ’s power! Back to reliance on the Holy Spirit, and to remembering that Jesus came to seek the lost. Is this an amazing thought?! If Christians will just approach their “frozen” friends and loved ones with the knowledge that Jesus Christ loves them and wants to save them—and with the expectation that Jesus can save them—then the Holy Spirit can work through our presence to begin the thaw around their heart. “Oh, do let us get back to this tremendous confidence in the Lord Jesus Christ’s power! Back to reliance on the Holy Spirit, and to remembering that Jesus came to seek the lost.” Amen!